Udon is a Japanese wheat noodle. 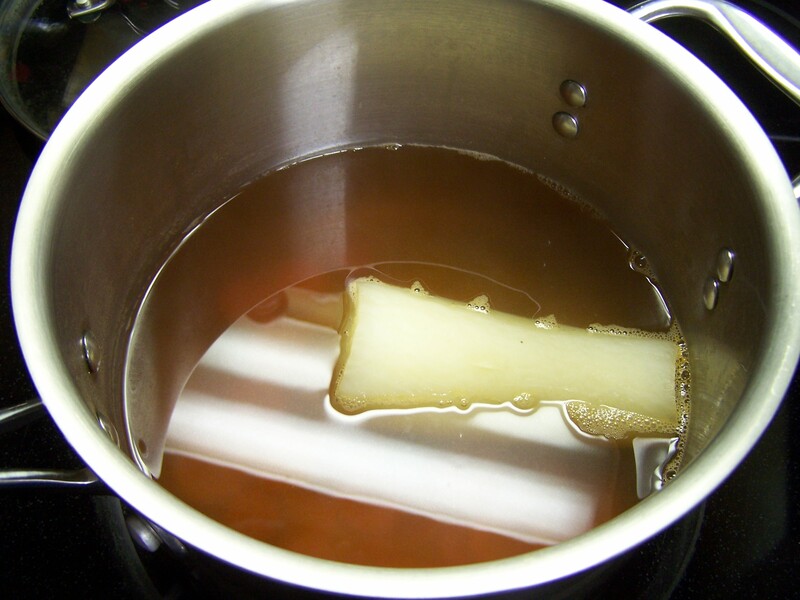 The most important part of this dish is a dashi stock. A dashi stock is made with a piece of kelp (which I don’t have), hon dashi (which is salty dried bonito tuna granules), sweet mirin (which is a sweet rice wine) and soy sauce. The taste is fine without the kelp. You won’t miss it if you don’t have it. Who has kelp hanging around anyway? Except for the udon noodles, each ingredient is cooked in the broth by itself for a little while depending on the ingredient, assembled in a big bowl and then the stock is ladled in. As each ingredient is added, the stock takes on a little different flavor. There are many versions of this soup. 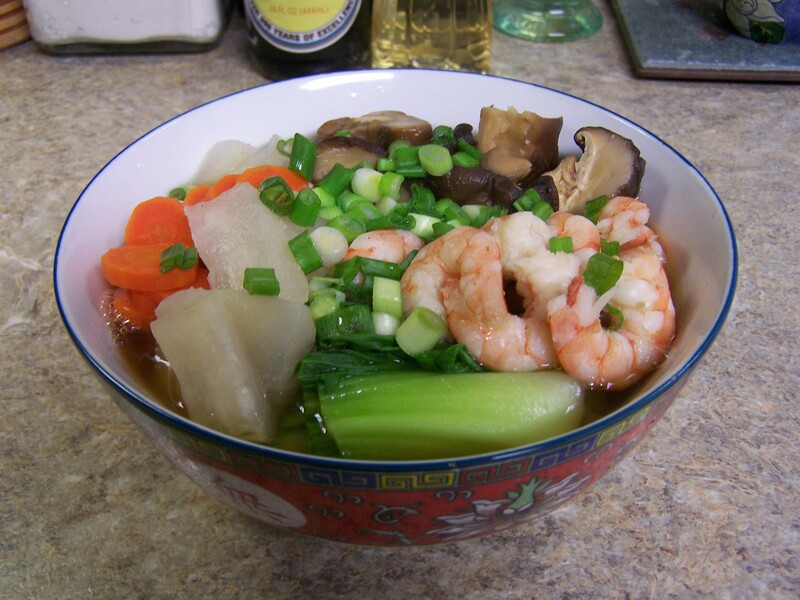 I use fresh shrimp, shiitake mushrooms, baby bok choy, daikon (Asian radish), carrots and topped with scallions. Place all ingredients in a pot and bring to a boil. Reduce to a simmer and cook 40 minutes. The udon noodles are prepared in an individual pack with a neat little wrapper in the center. 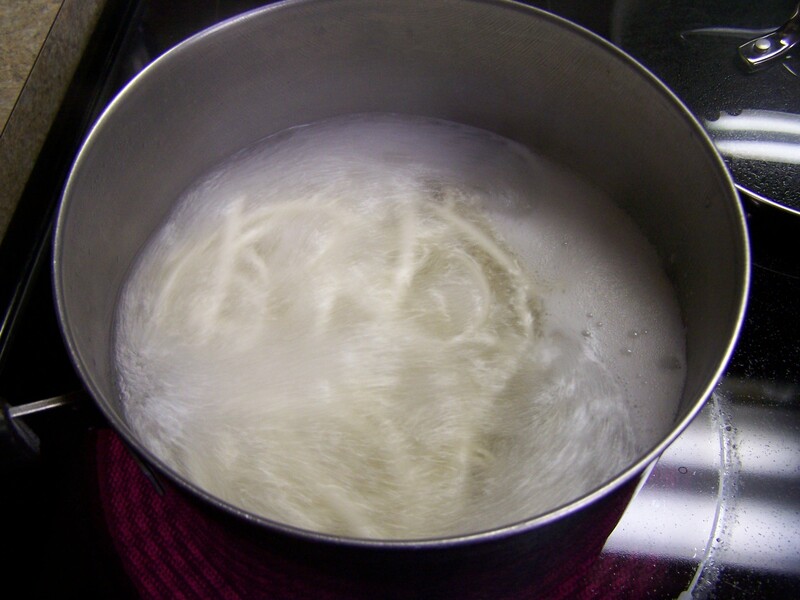 Boil the udon noodles in a separate pot b/c the noodles will absorb too much liquid if boiled in the dashi stock. Typically, noodles take exactly 12 minutes to cook but cook these exactly 10 minutes. They will continue to cook when added to the bowl later. 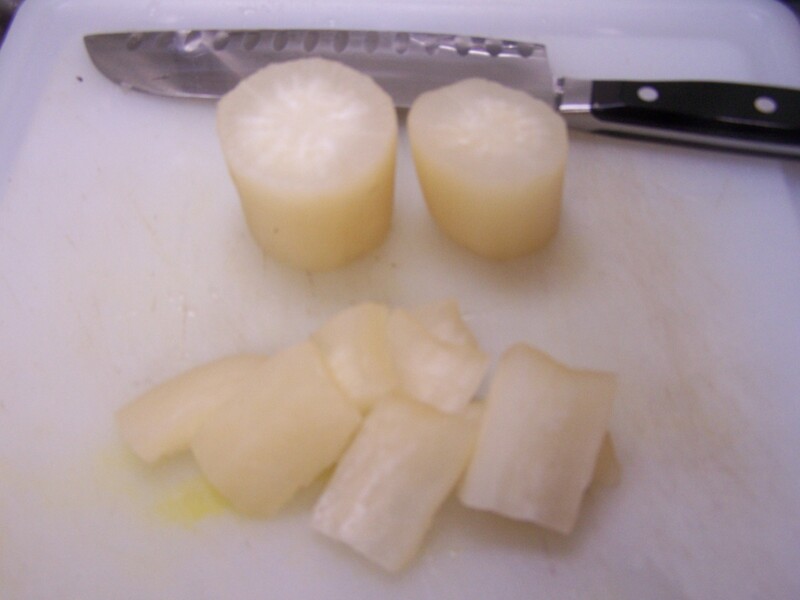 Remove the daikon and cut into pieces. In the dashi stock cook carrots for five minutes and remove to a bowl. Cook shiitake mushrooms five minutes and remove to a bowl. Cook the shrimp three minutes and remove to a bowl. Cook the baby bok choy two minutes and remove to a bowl. To serve, drain and strain the udon noodles from the clear water and add to the stock for a few minutes, remove from the stock and place the noodles at the bottom of the serving bowl. 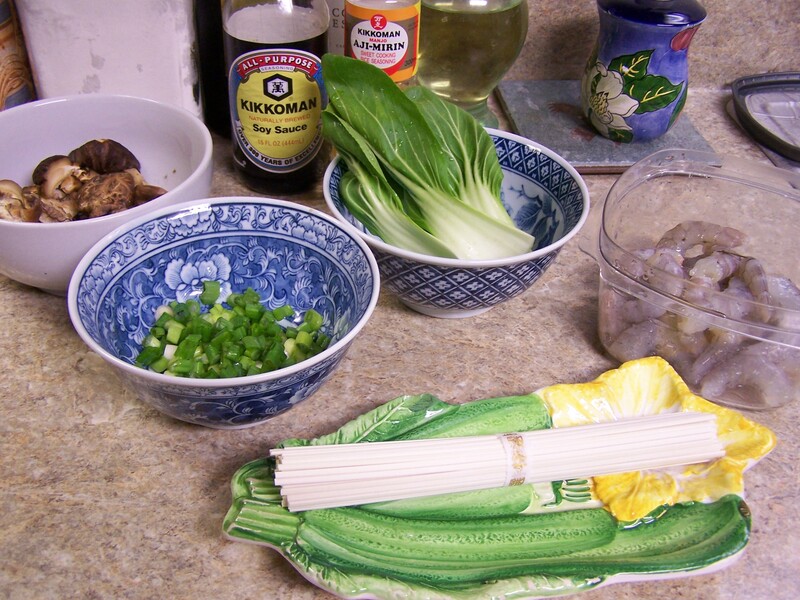 Arrange the vegetables the way you like and add the shrimp and the scallions and ladle in the hot stock. Any remaining stock can be cooled and saved in the frig for another day. Overall this looks like a big process but it goes fast and the dish is completely wonderful and healthy I might add. 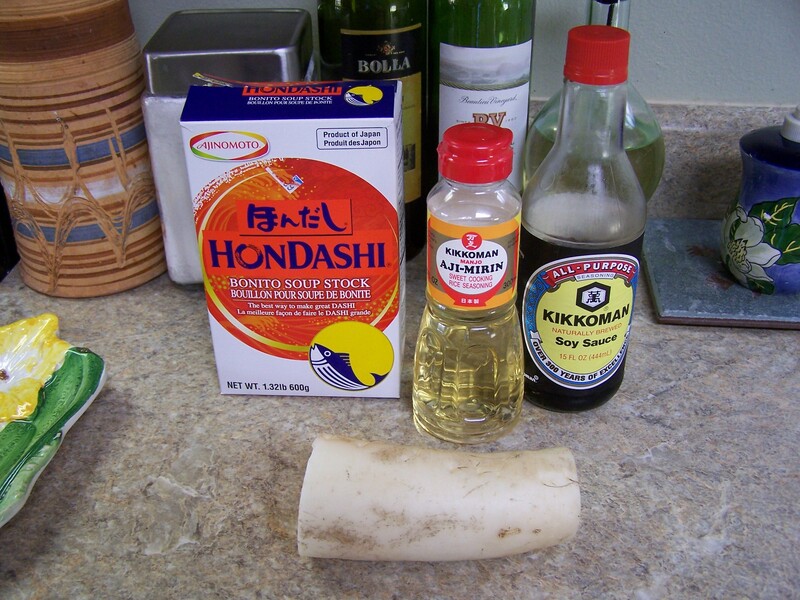 You can find Hon Dashi online if your local Asian store does not have it. There are many variations of this soup from a Spanish cumin flavor to a sweeter version I prefer with sherry added when served. I have perfected this dish over many years and I say perfected b/c when served hot on and cold day there are few things better. I have merged several variations such as I only use red bell pepper rather than green, a fresh Jalapeño pepper rather than chili pepper and instead of cilantro I use ground coriander, which is ground cilantro seed. In a large pot boil black beans in chicken stock, then simmer one hour. Drain beans and save the stock. Clean the soup pot. Add olive oil, get hot and fry the bacon. Add onions, red bell pepper, celery, carrot, garlic and Jalapeño pepper. Sauté for 6 to 8 minutes. Add white wine. Add Black forest ham. Return the beans and the stock. Add butter, salt and pepper and the coriander. Stir. 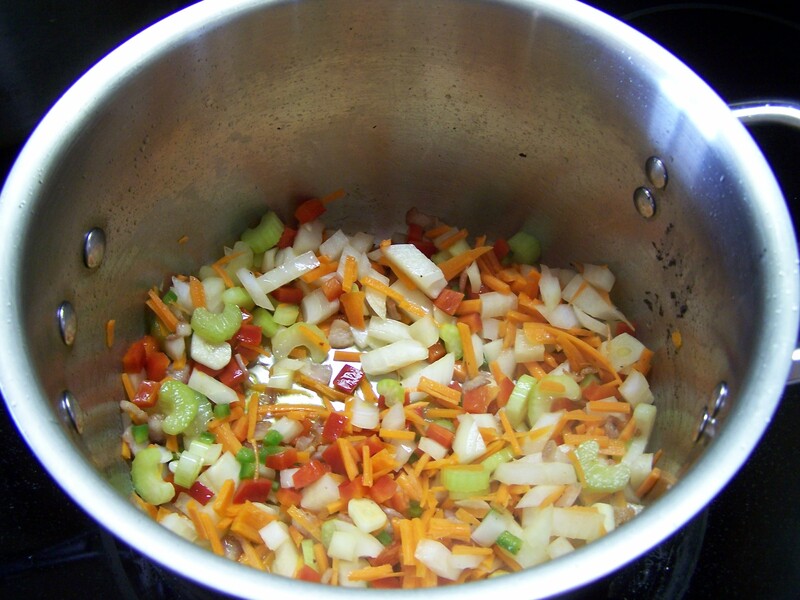 Add a little water if necessary to raise the level of the soup. Lower the heat to simmer and cook one hour. The idea is not to cook all 16 oz. of beans as not to make the soup too thick or overrun with beans. I also don’t want to get the soup too hot or boil the heck out of it so that the flavors gently blend. 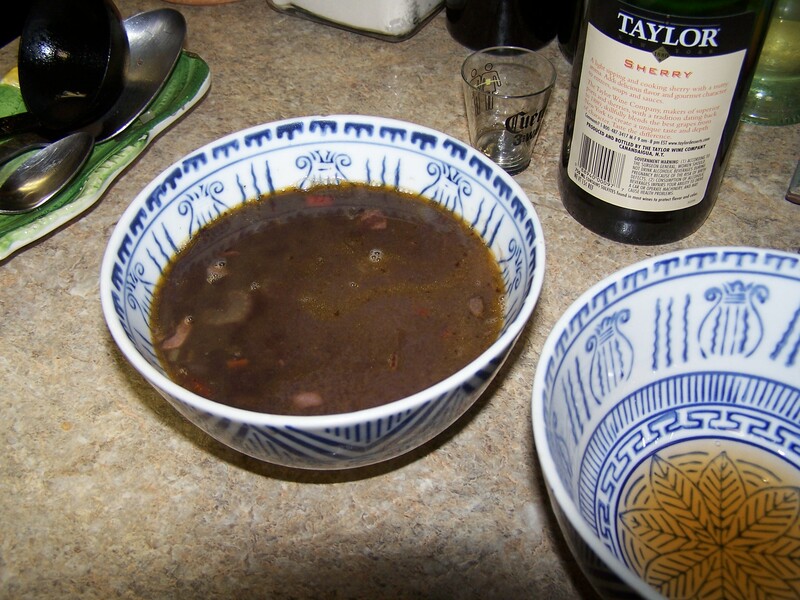 When serving, pour one shot of sherry in the bowl and then ladle the soup into the bowl. 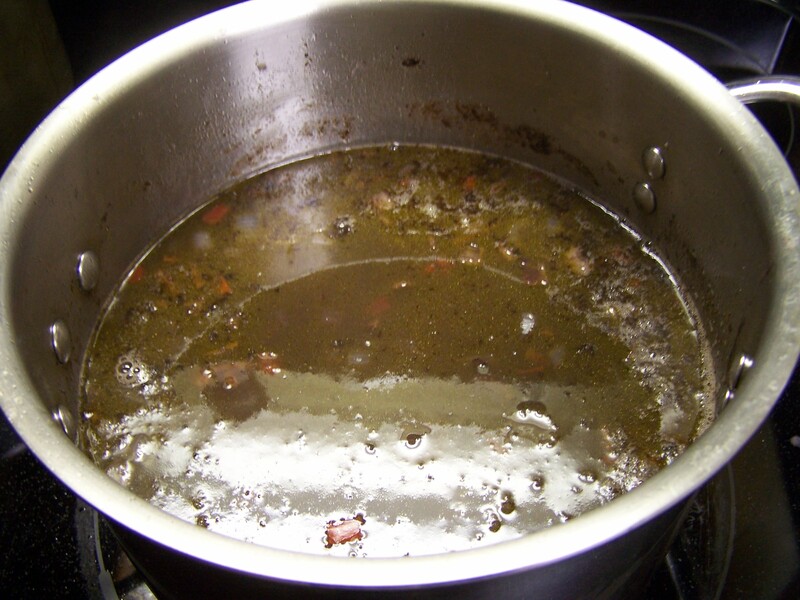 The warm soup will generate the sherry flavor into a very appetizing aroma. The first time I had this dish was at a restaurant in Bay St. Louis, MS, which is exactly a one hour drive to New Orleans. That restaurant was completely destroyed by Hurricane Katrina. I struggled looking for a recipe to match it. Poking around the Internet I learned this soup originated at Le Ruth’s Restaurant in New Orleans. LeRuth’s closed in the 1990’s. I still have a framed poster of their restaurant hanging in my kitchen (see below) given to me by a chef that worked there with Warren LeRuth. Warren is credited with creating this dish. At all the restaurants that serve this dish today there are two versions – with or without cream. I chose with cream, but not much. The next big decision is to make it with a Béchamel sauce (oil, flour, cream) or with a mashed potato. I chose the potato. Another deviation is I use marinated artichoke hearts instead of fresh. I drain them but leave a little of the oil/vinegar for more flavor. However, I will blend the other 8 oz. jar of artichokes with a white onion, leek, celery and garlic. I will use the oyster juice in the container to add a little fish stock taste. At the end I will toss-in the raw oysters and let set until they warm a little (15-20 minutes). I will serve this with freshly baked bread. There are two Asian soups I really enjoy. I am totally O-M-Lambs besotted about them! One is a Vietnamese soup called Pho (Phở) and the other is Korean Samgyetang. Pho is pronounced “fuh”. In fact, I get it from a restaurant here called What the Pho. Pho is a complicated broth made with beef brisket, ox tail and beef bones, rice noodles called bánh Phở, star anise and other specialty herbs. In south Mississippi it is as popular as Gumbo. It is much cheaper to buy than to make. The other soup is Korean Ginseng Chicken Soup (Samgyetang). This soup is perfect for the cold wet days to come when the germs and bugs are out and you’re feeling under the weather (or not so O-M-Lambs besotted). It is much simpler to make than Pho, but it requires a visit to the local Asian market. I work near a wonderful Vietnamese market that sells all the necessary ingredients. The main ingredient for this soup obviously is dried ginseng root. If ginseng root is not available you can use red ginseng tea sachets. The other is a red Asian date called jujube (jujuba). This date comes from the Ziziphus jujuba plant. Of course you need to find a small one serving chicken. I have seen recipes recommending a Cornish Hen if you can’t find a small single serving chicken. 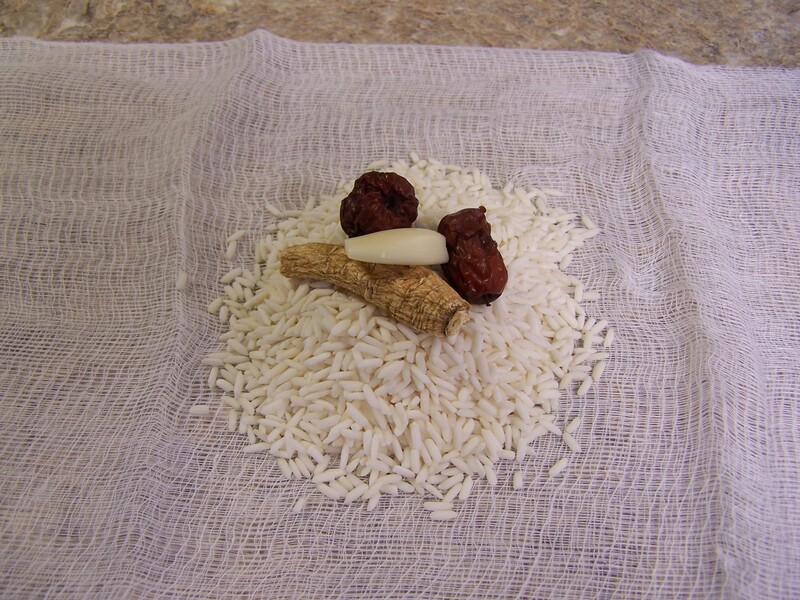 You will also need garlic cloves and sticky rice. Ask for “sticky rice”. I asked for glutinous rice and the clerk had no idea what I was talking about. I then asked for sticky rice and he walked me to the rice section and pointed to two bags. One bag he called “sticky rice” and the other bag he called “very sticky rice”. He laughed. Make the broth and bring to a boil then reduce to a simmer. 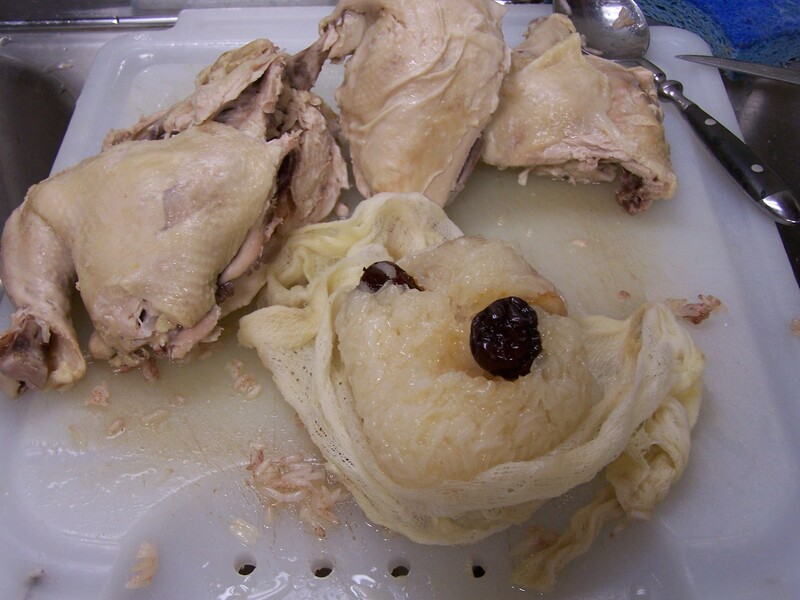 Stuff the chicken with the rice stuffing and close the chicken with a toothpick and then make the rice pouch. Put everything in the pot and simmer for 1 ½ to 2 hours. Serve with chopped green onions. 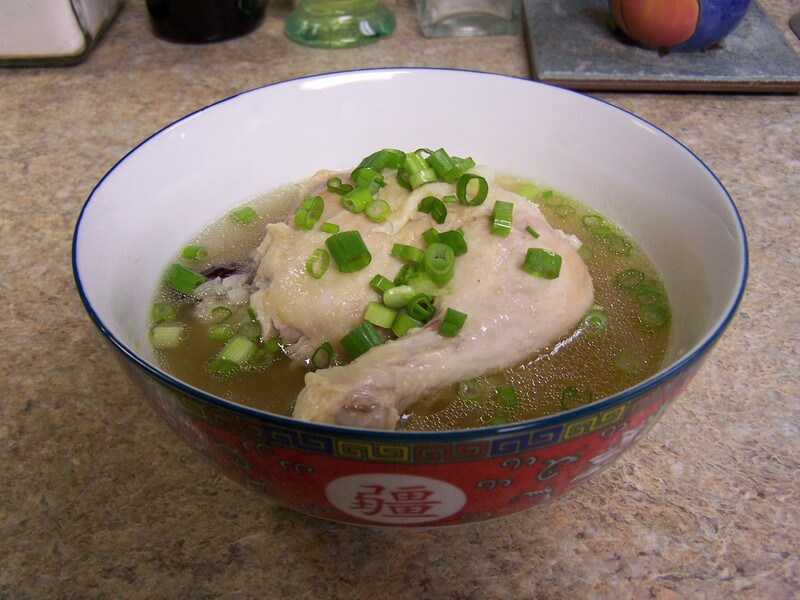 Serve by spooning rice in the bottom of the bowl, add chicken, soup and cover with scallions. 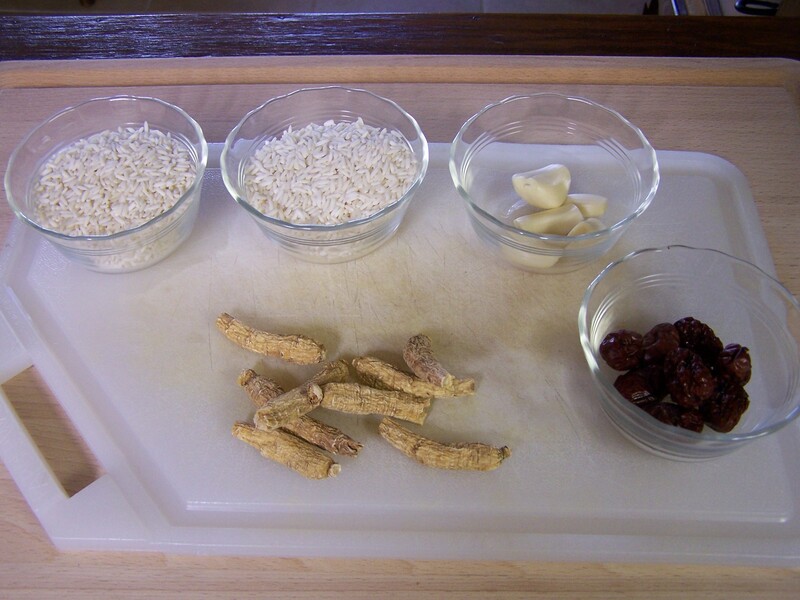 The ginseng has a wonderful musty comfort food flavor. 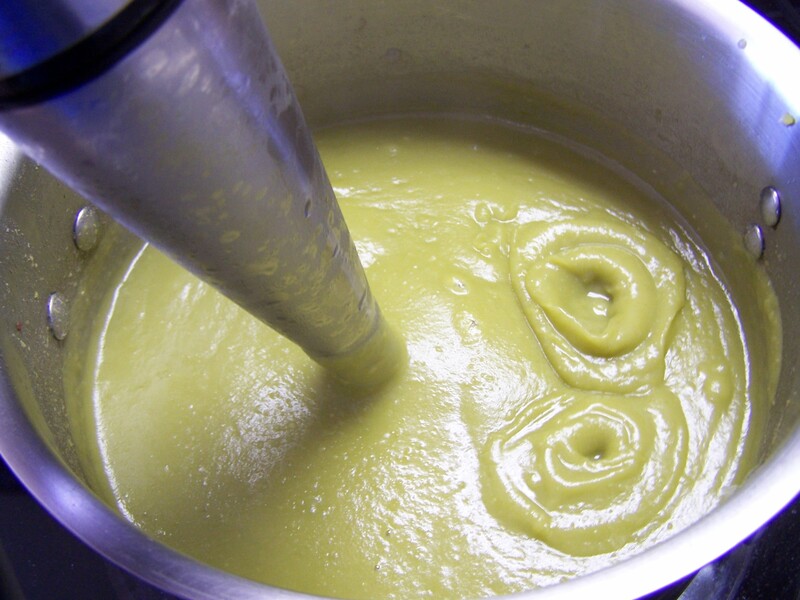 I like a silky thick Split Pea Soup. Some like it with roughage, but I like it silky. 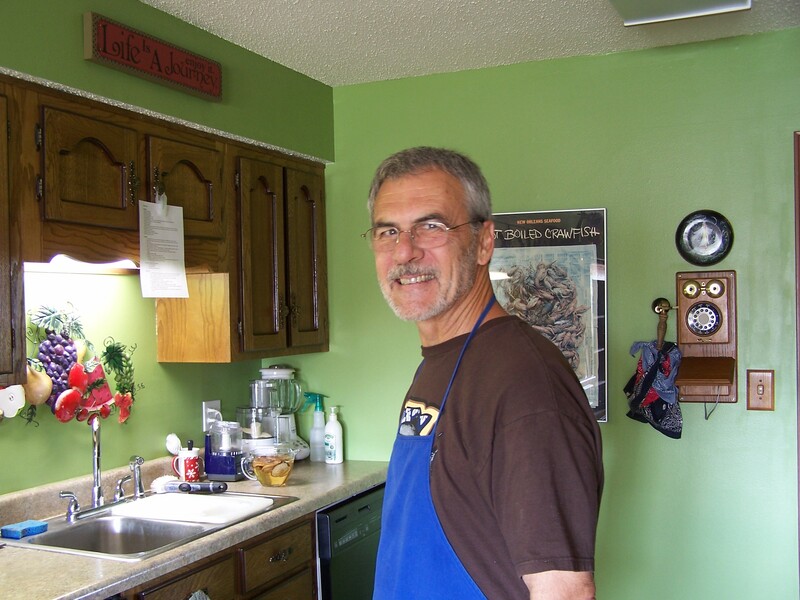 About 40 years ago I also learned how to top this soup with Parmesan cheese and Soy Sauce. The way I make it silky is with a hand blender. This pot is best layered in flavors. First fry bacon, then add the vegetables, then the meat and herbs. First cut the fat from the bacon and then cut the bacon into strips (lardoons). Add the bacon to the pot and fry for 10 minutes. Remove the bacon and set aside. Add the onions, celery, garlic, olive oil and sauté 8 minutes. 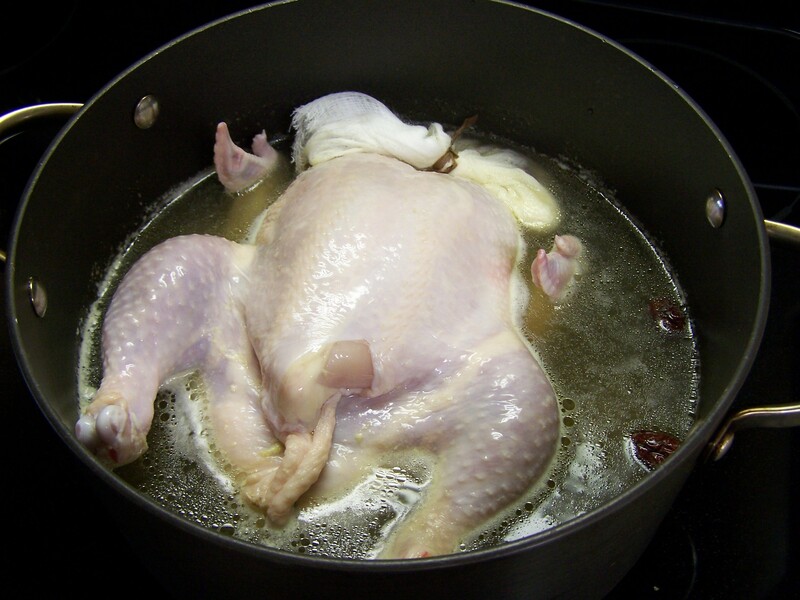 Add white wine and deglaze the pot. Add split peas, potato and chicken stock. Bring to a boil and then reduce to a simmer and cook one hour. At this point take out the hand blender and blend the pot. Add all the meat, bay leaf, basil leaves, salt and pepper and a little water. I use basil from one of my basil plants. I also add the carrots. I use a Julienne peeler and then chop the carrot. Simmer another hour. Serve with Parmesan cheese and soy sauce.